The American Heart Association estimates that 80 million Americans have one or more forms of cardiovascular disease, which can result in high blood pressure, coronary heart failure and stroke. Coronary heart disease is caused by atherosclerosis, the narrowing of the coronary arteries due to fatty build up of plaque. Coronary heart disease caused 445,687 deaths in 2005 and is the single leading cause of death in America today, according to the American Heart Association. Each year, more than one million patients with coronary artery disease are treated with stents, according to the National Center for Health Statistics. 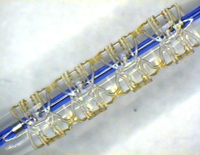 These small wire-mesh tubes, usually made of stainless steel or another metal, are inserted into the small arteries surrounding the heart to keep them open. In some cases, however, the stented artery narrows again. This process, called restenosis, may occur because the rigid metal stent injures the artery walls and causes cells there to proliferate. To develop improved stents that can address the problem of restenosis, our scientists have developed degradable polymers that are less rigid than metal. The Kohn Lab continues to work toward refining the qualities of the polymers available for stents.